Jon Stewart, former host of The Daily Show, and long-time supporter of the Warrior Games, will join ESPY recipient Israel “DT” Del Toro, Army Ranger Cory Remsburg, local Marine Mike Nicholson along with several other wounded warriors on the 2019 Warrior Games float in the Gasparilla Parade of Pirates on Saturday, January 26. Air Force Sgt. Israel “DT” Del Toro who received the Pat Tillman Award for Service at the ESPY Awards in 2017. He won a gold medal in the 2016 Invictus Games and has participated in eight Warrior Games as either an athlete or a coach. He will represent SOCOM in the 2019 Games as an assistant captain. Army Green Beret Master Sgt. George Vera was paralyzed from the stomach down, after a gunfight with the Taliban in 2015. Last year, Vera won gold medals in shotput and discus and earned two bronze medals in cycling. Army Ranger Sgt. 1st Class Cory Remsburg was recognized by President Barack Obama at the 2014 State of the Union address. Cory’s recovery from severe head trauma and partial paralysis will allow him to participate in his first Warrior Games this summer in Tampa. Retired Marine Corps Sgt. Mike Nicholson, a Tampa native and Plant High School graduate, was injured in a bomb explosion in Afghanistan in 2011 that left him a triple amputee. In 2017, he competed in his first Warrior Games, winning six Gold medals. Staff Sgt. Lauren Montoya lost her left leg after an IED explosion in Afghanistan in 2014. She competed in the 2016 Invictus Games and the 2018 Warrior Games for SOCOM. Additional wounded warrior athletes on board include Navy Cmdr. Clay Pendergrass, team SOCOM captain; Senior Airman Karah Behrend and Master Sgt. Kenny Guinn representing the Air Force; Sgt. Brian Serna, Pfc. Kyia Constanzo representing the Army; and Marine Cpl. Tim Read. The Warrior Games will be held in Tampa Bay, June 21-30. Competitive events will be held at venues throughout the community including Amalie Arena, Tampa Convention Center, The Long Aquatic Center and University of South Florida. The Warrior Games were established in 2010 to demonstrate the incredible potential of wounded, ill and injured service members. 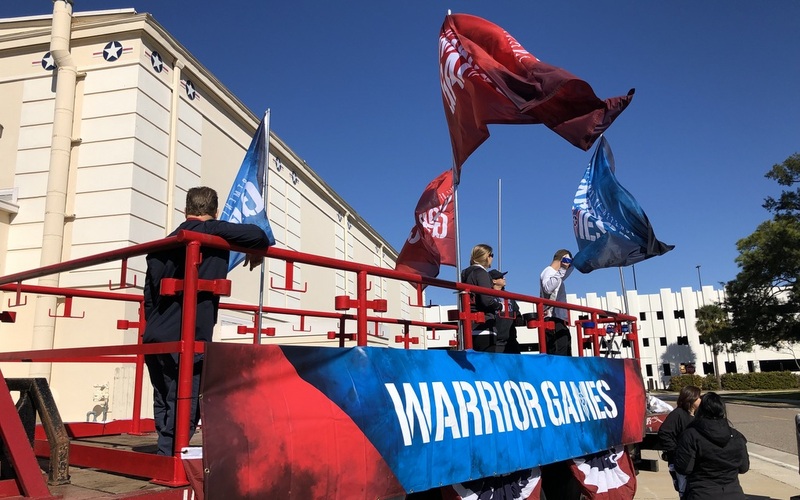 U.S. Special Operations Command is hosting the 2019 Warrior Games and will feature 15 sporting events with about 400 athletes representing teams from the Air Force, Army, Marine Corps, Navy, and U.S. Special Operations Command, as well as representatives from our allies including the United Kingdom, Australia, Canada, Denmark, New Zealand, and The Netherlands. For the latest on theme parks, attractions and more across the region, be sure to follow Touring Central Florida on twitter @TourCentralFL, @androckb, @Emmet_TCF, @JacobTouringCe1, and give our facebook page a like. Book a Private VIP Tour with us! Copyright © 2019 Touring Central Florida. All Rights Reserved.